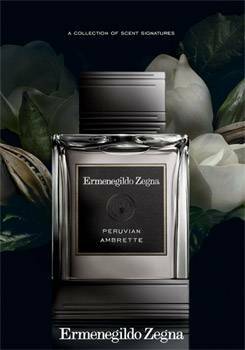 Ermenegildo Zegna Parfums introduces Peruvian Ambrette to the exclusive Essenze Collection. Like the original fine fragrances of the Collection, Peruvian Ambrette is its own expression of one signature raw material with its own unique provenance. Discerningly sourced. Brilliantly composed. Like the finest tailored designs. The signature raw material, ambrette, comes from a very small yield of tiny seeds and a multi-step process, making it one of perfumery's most expensive and rarest ingredients. Derived from the San Martín region of Peru's Amazonian rainforest, the seed produces a fragrant essential oil, a sweet rich musk with nutty undertones, which is considered the only natural non-animal musk ingredient in the fragrance industry. The common thread that unites all scents of the Essenze Collection, the seventh fragrance of the Essenze Collection, Peruvian Ambrette's construction is distinctively paired with exclusively grown Zegna bergamot from Calabria, Italy. Peruvian Ambrette opens with the citrus sparkle of mandarin oil and Zegna bergamot. This freshness skillfully contrasts with black pepper for a top mark of distinction. At its heart, elegant orris meets with the sweet and deep ambrette to create a luxurious texture. The drydown is an enveloping relationship between an exotic suede accord and a selection of sophisticated musks, which is enhanced by the masculine warmth of guaiae wood. Just as Ermenegildo Zegna uses only the finest fibers and fabrics to create its iconic fashion collection, the Essenze Collection is crafted from the most exquisite raw materials, recast as an exotic essence. Extending a work of hands from earth to atelier. From cultivation to fabrication. Each fragrance in the Essenze Collection,Italian Bergamot, Sicilian Mandarin, Javanese Patchouli, Indonesian Oud, Florentine Iris, Haitian Vetiver and Peruvian Ambrette is housed in a modern glass bottle and features a custom label with a corresponding coloured border that reflects the key notes in each scent. Each fragrance of Essenze has a retail price of $250 (125ml) and will be available exclusively at Ermenegildo Zegna boutiques and selected David Jones stores.